Albany grew on us. Quite quickly. When we first arrived we weren’t too sure it was going to the place for us. We ended up staying longer than we planned. Albany was one of those comfy couch type places, where you soon find the right mould for you and are happy to just sit and chill for awhile. So that’s what we did. Chilled a bit, caught up on some work, and did a little exploring. 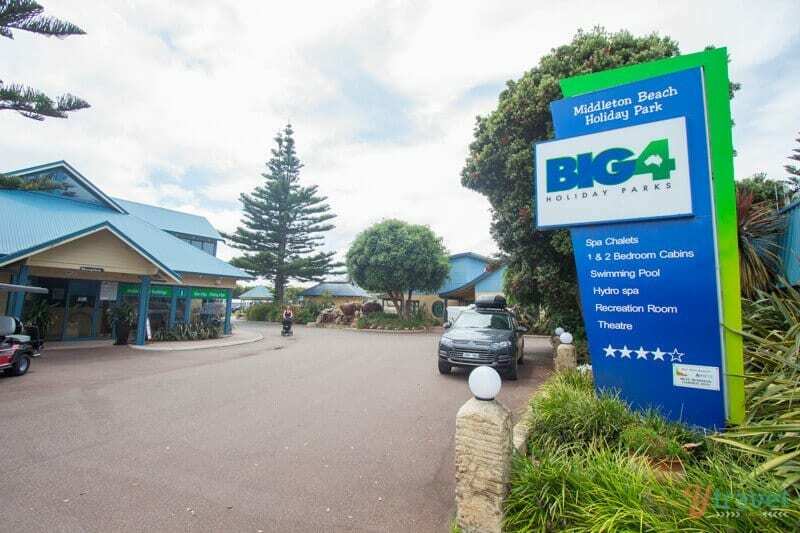 We started at the Big 4 Holiday Park, which was right on Middleton Beach, Albany’s most well-known beach. We camped for the first four nights and then escaped to a Beach House for some much-needed solid-wall time-out. Two Peoples Bay Nature Reserve about 35km drive from Albany. 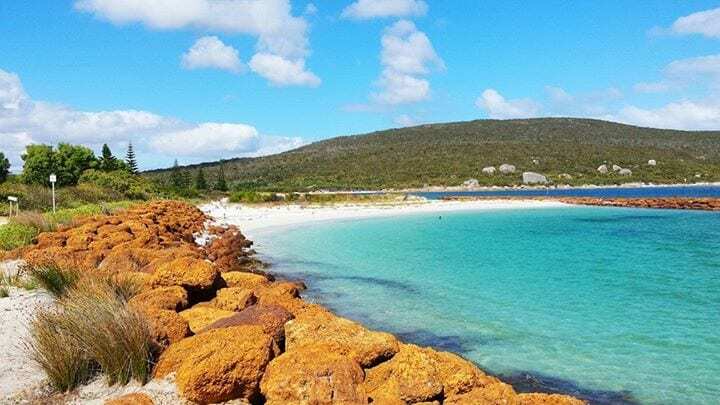 Beneath Mount Gardner on the bay’s northern headland, are two spectacular beaches in the Albany region that will be a highlight of your trip to Albany – if not Western Australia. Little Beach may be little in size and name, but definitely not in beauty! Some of the most pristine, powdery white sand you can see and brilliant sparkling turquoise water. Honestly, it’s not until you’re standing in front of WA beaches that you comprehend all those photos you’ve seen are not lying, it really is that colour and how can anything have colour like that!! If you follow Little Beach around to the end, you’ll see a little track leading up through the bushes past the boulders. Do not be afraid. Follow it. You’ll arrive at the little hidden, Waterfall Beach. 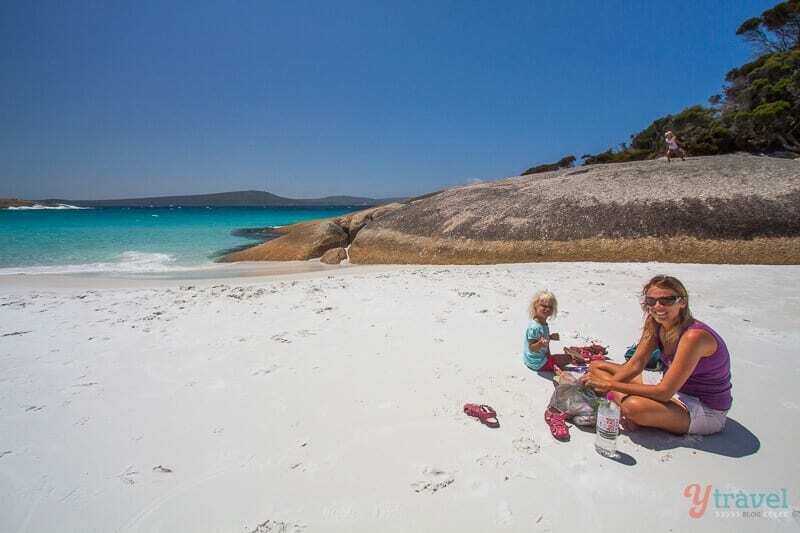 It’s totally keeping up Western Australia’s title of best beaches in Australia. Scrap that. 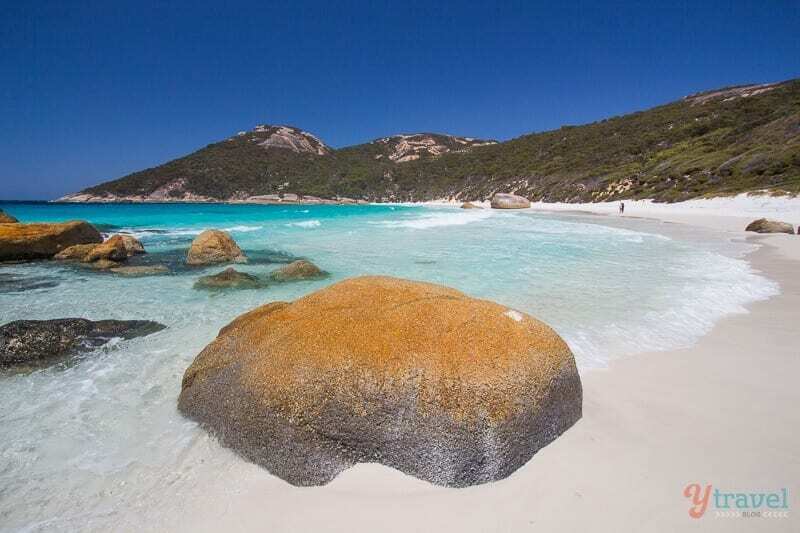 Best beaches in the world. You could possibly even have it all to yourself. There were not may people when we stopped for a couple of hours to play and appreciate the stunning views. There are plenty of huge boulders for your children to climb up on. Waterfall Beach is named for the waterfall that gushes down from the rocks and on to the beach. It was not gushing, nor trickling when we visited. We were not disappointed as there was plenty more to look at! 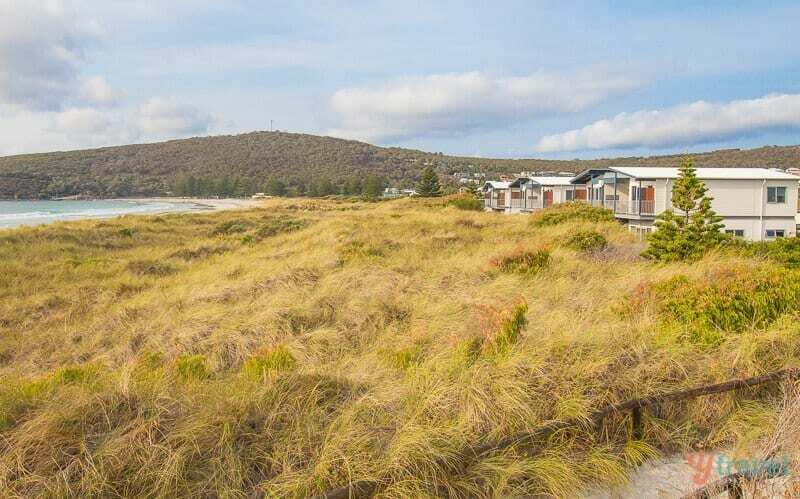 Middleton Beach is the closest beach to town so is Albany’s most popular beach. After seeing so many extraordinary white sand beaches in WA, this one had a greyer look, but still beautiful in its own right with its views out to King George Sound. It can have good waves for surfing and there is a jetty and pontoon for jumping off. 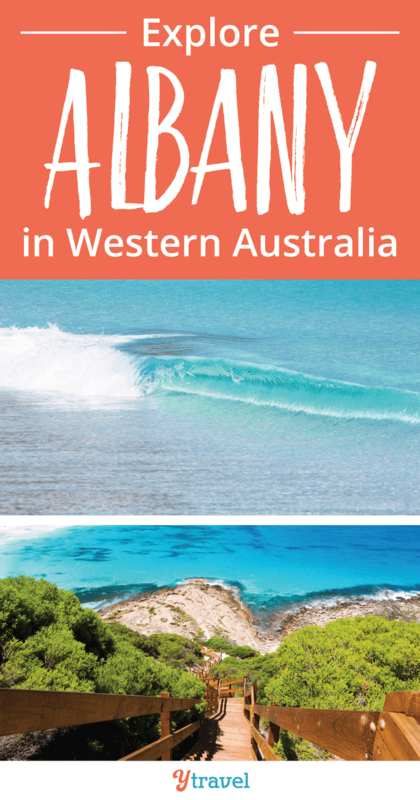 Albany is great for bike riders, with various trails talking you isolated unspoilt beaches, rugged coastline, native bushland and nature reserves. We went for a short afternoon ride along the 8km return coastal path from Middleton Beach to Emu Point. There were a quite a few little rolling hills so it kept Kalyra (and myself) entertained as we raced over them yahooing on the way down. Plus, we had lovely views along the way. We stopped at the Cafe at Emu Point for a coffee and muffin break, while the kids played in the park and we watched the kayakers and SUPs coast by in the calm waters. 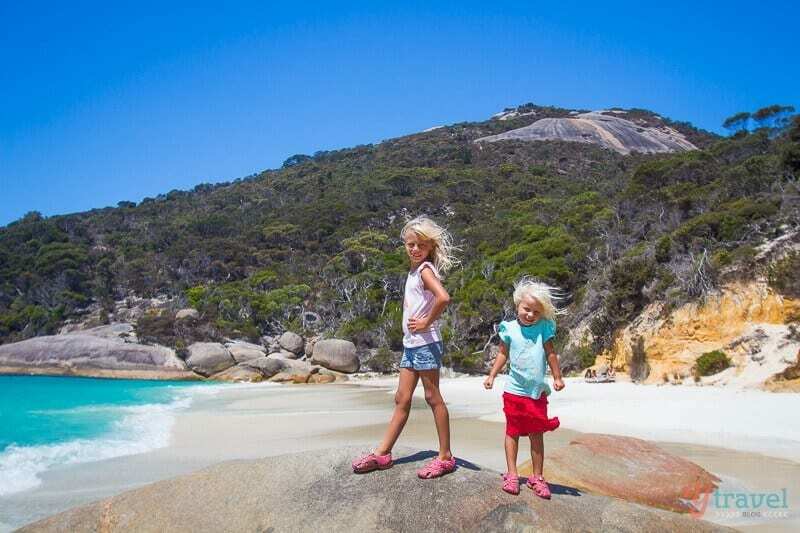 Our friends also enjoyed the bike ride from the Big 4 campground around the cliff face into Albany town. 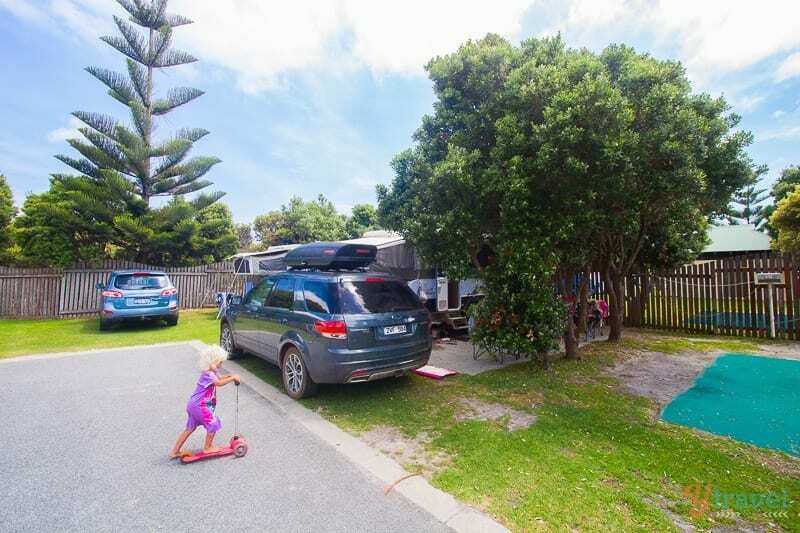 On Middleton Beach and a short scooter ride from the Big 4 campsite, Three Anchors became our local. 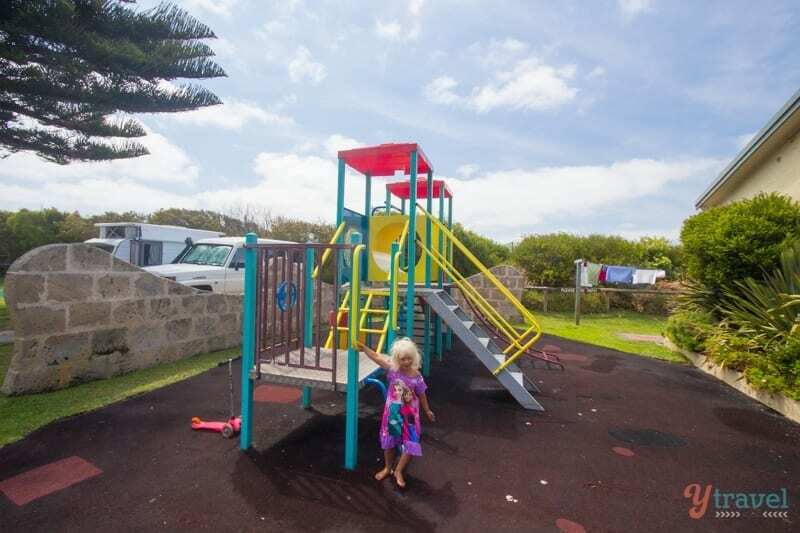 The girls were entertained in the playground out front shaded by the Norfolk pines. 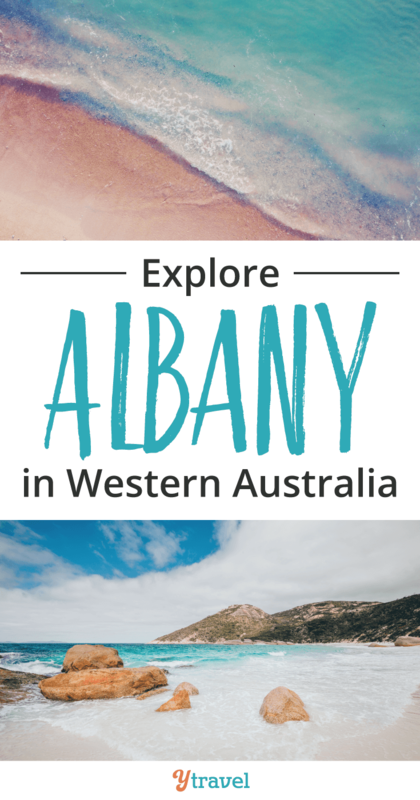 We had the pleasure of chatting with a reader who recognised us and gave us lots of great tips on things to do in Albany. Three Anchors also has live music. It’s a brilliant spot for families to close out the day. We did not visit the centre but heard from friends who did that it was excellent. 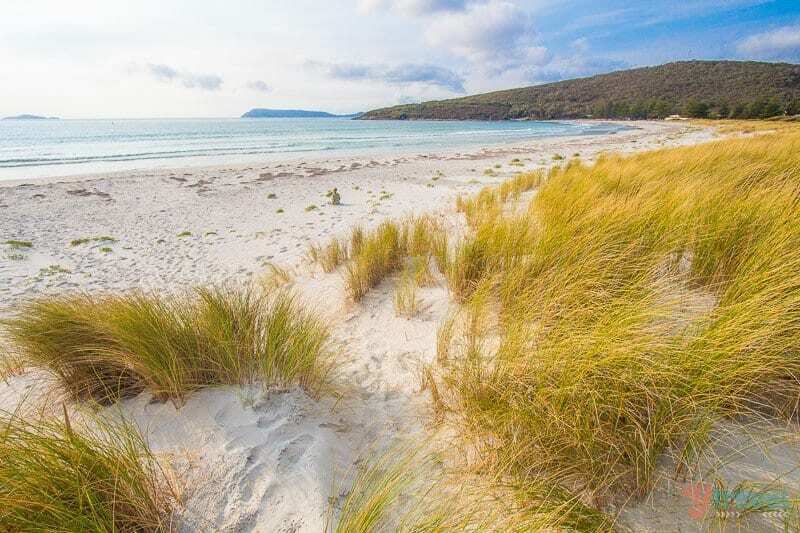 Albany is known as the birthplace of the ANZAC story as On 1 November 1914, the first convoy of Australian and New Zealand troops departed for the First World War from King George Sound, Albany. For many, Albany was their last sight of Australian soil. Anzac lookout. 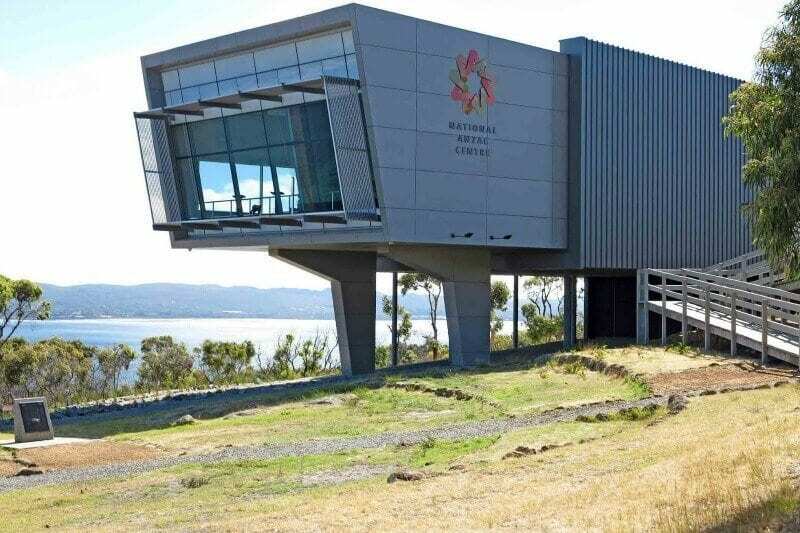 The National Anzac Centre uses multimedia and interactive technology to create a deeply personal connection with the past, as well as pay tribute to those who served. Lonely Planet named it as one of the best new travel experiences in the world! 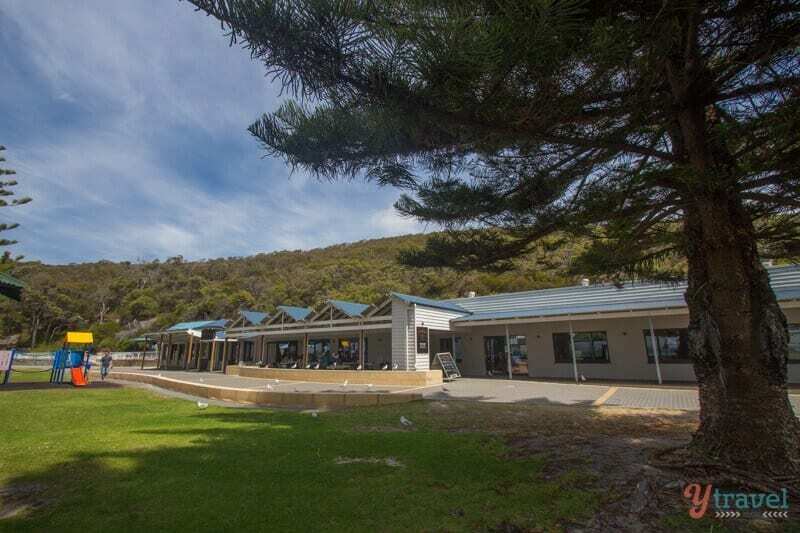 The Centre is set within Albany Heritage Park overlooking the overlooking King George Sound. 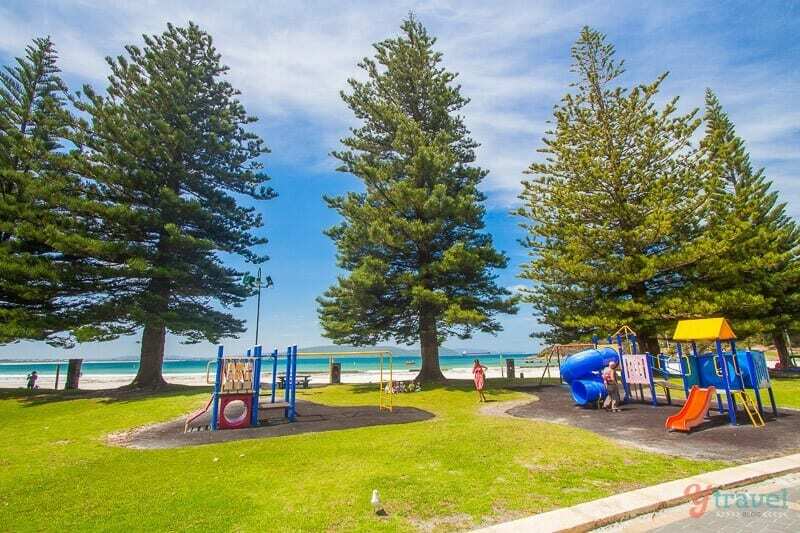 Albany Heritage Park is a 260 hectare parkland reserve set in the heart of Albany. 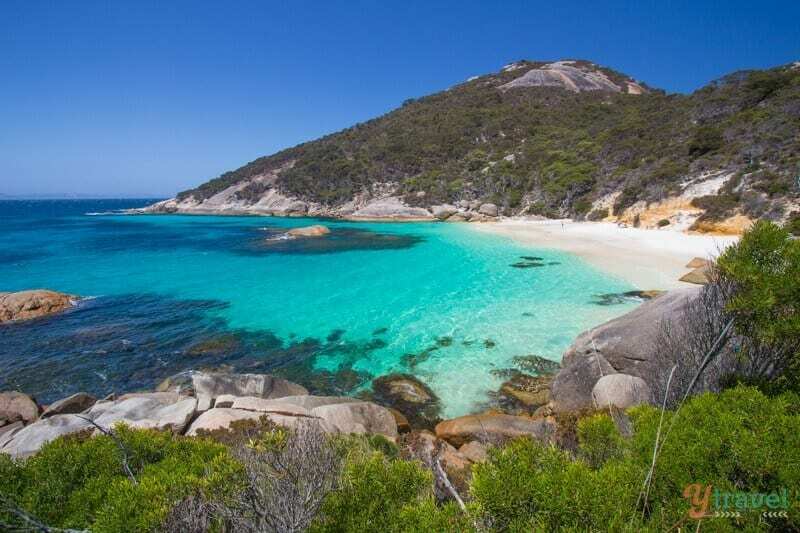 It surrounds the summits of Mount Clarence and Mount Adelaide and stretches from the Port of Albany to the shores of Middleton Beach. 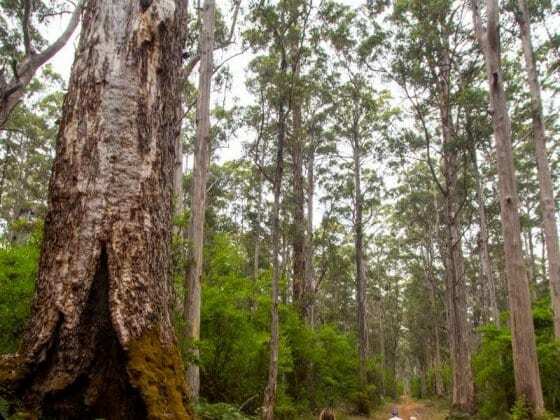 Within the park, the Padre White Lookout is the region’s most visited lookout and large gum trees line the Avenue of Honour on Apex Drive – the road to the top of Mount Clarence. At the base of each tree plaques bear the names of soldiers lost at war. It’s worth taking a drive out to see the Albany wind farm, only 12km south-west of the city centre. 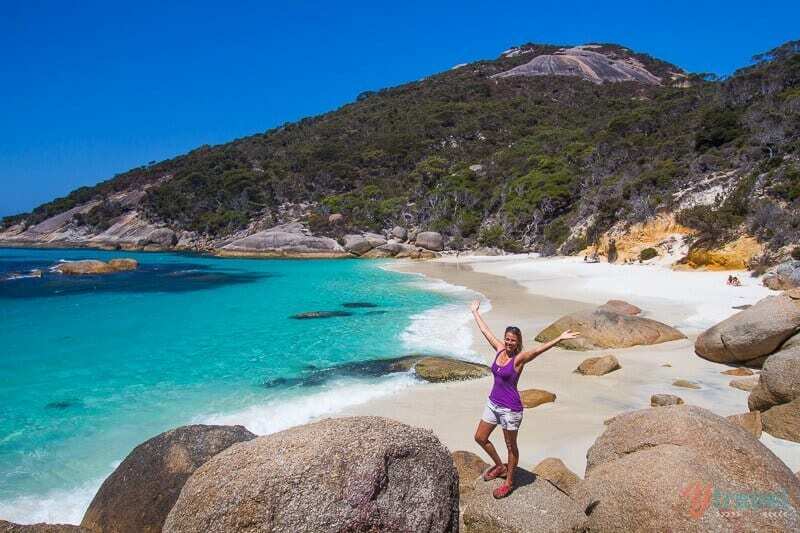 Not only does Western Australia win the best beaches award, but the windiest state! It’s the most perfect state for alternative forms of energy. Except I wish it wasn’t called alternative. 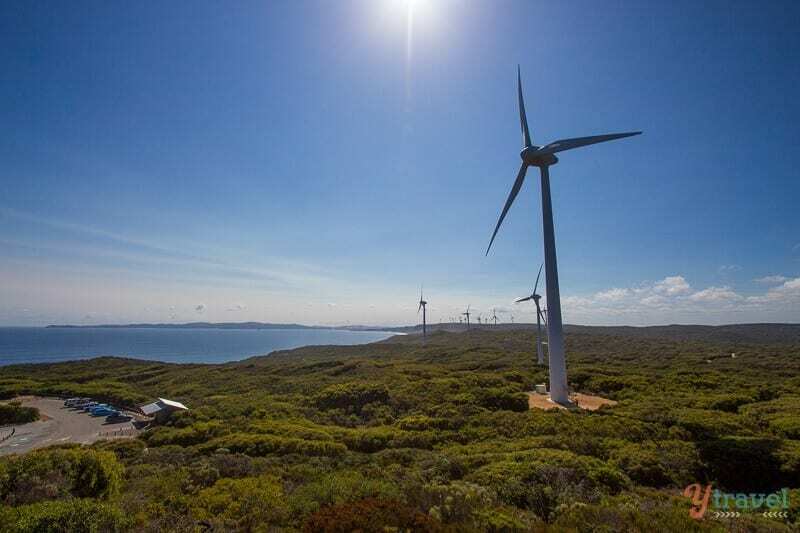 The Albany wind farm is elevated 80 m above the Southern Ocean – the perfect place to catch the wind. 80% of the power needed to run the town of Albany comes from these 65 metre-high turbines. There are several boardwalks and lookouts in the area. Take your camera and your admiration! We only stayed in the Big 4 Middleton Park so can only recommend that! The campground was a nice, a little narrow, but modern and clean and perfect for what we needed. 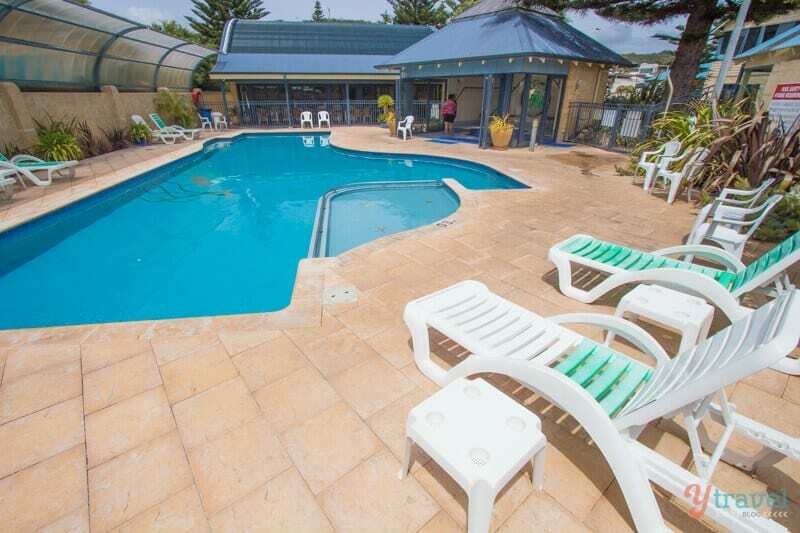 Right on the beach and just a short drive or cycle into Albany town. It was peaceful and great for kids. There was a recreation room they enjoyed playing in and a quieter movie room stacked with toys and videos. It was perfect for us on the rainy days we had – which we loved as it was the first rain we experienced after 9 months! Bliss. 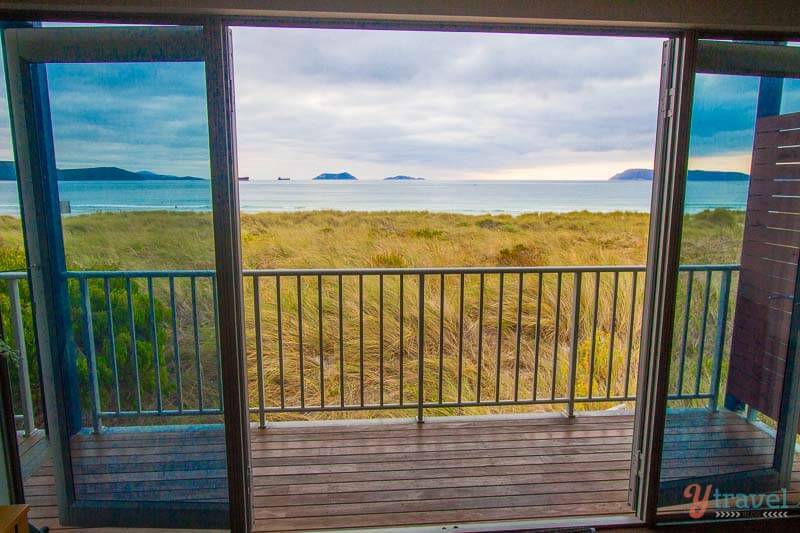 If you can afford the upgrade, we highly recommend the Beach House. We stayed courtesy of the park and loved it! The deck became our school room for one morning and the views were gorgeous. It was nice to have a full kitchen and space to spread ourselves out. 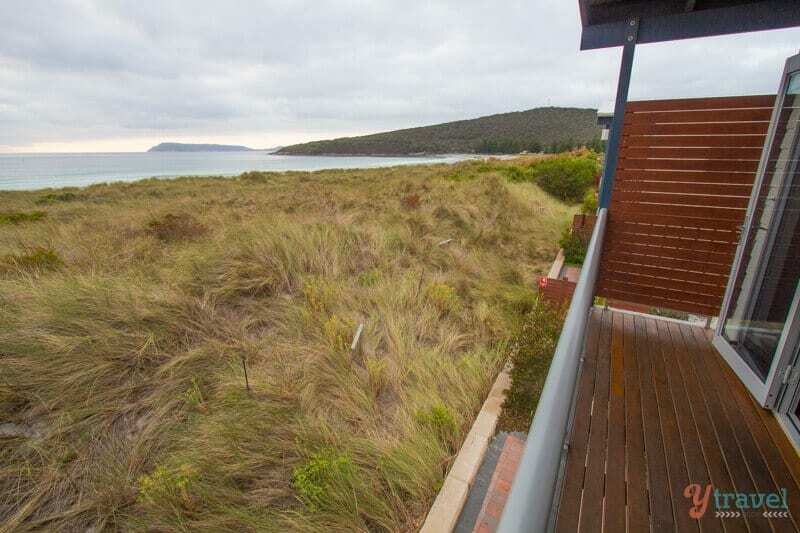 Kathy Maris – Walk from Middleton beach around to Albany harbour past the Ataturk Statue. 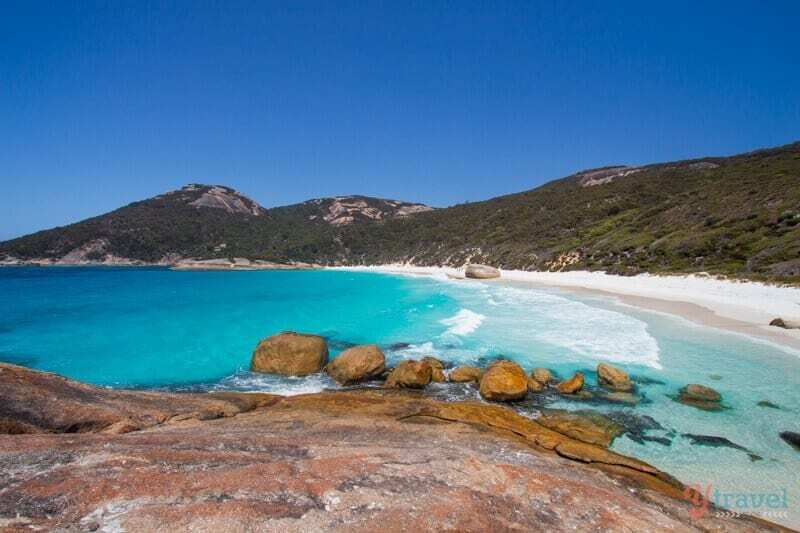 Also do a trip out to Torndirrup National Park for some amazing scenery. Katrina Stewart Gott – Mountain bike track down the hill from the Anzac memorial! Hire a mountain bike for one of you. Tyla Fitch – Whale world is great. 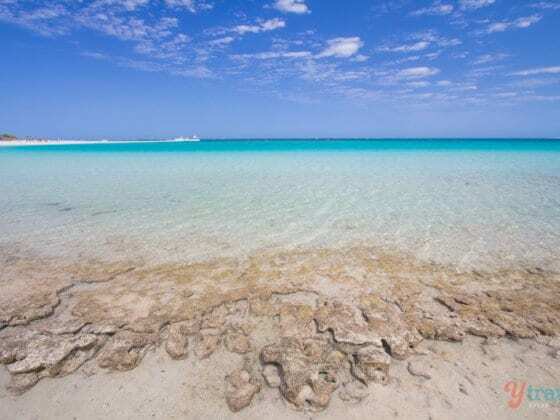 Wild Western Australia – Waychinicup inlet (stop on the way to Esperance?) Look inside the amity, tall ship replica on harbour foreshore. 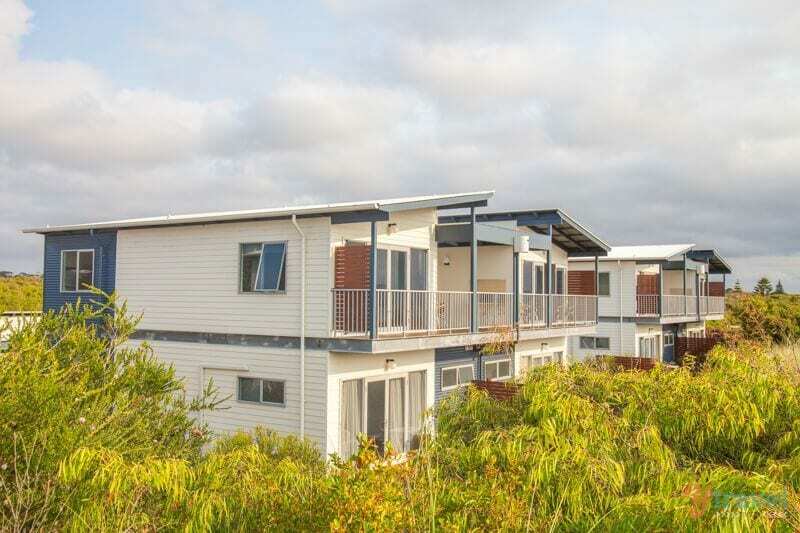 Two lovely coastal walks: point king walk from Middleton beach to town, and Point Possession heritage trail for more beautiful views of the harbour and ocean. The wind farm on the cliffs at sunset. 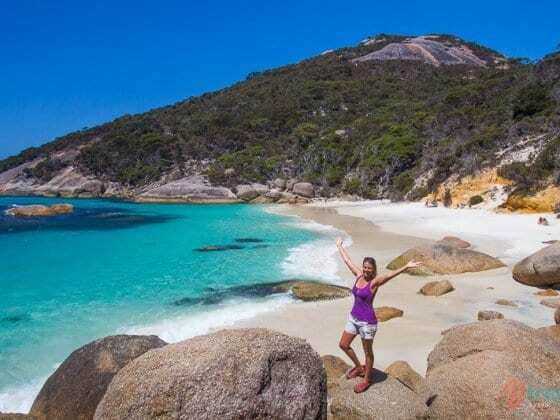 So many beautiful beaches including Salmon Holes, Misery beach, Goode beach, Whalers cove, Nanurup, Ledge beach, Mutton bird island, Shelley beach. Some good for swimming, others not so much but very scenic. Whale world, Princess Royal fortress, West Cape Howe NP day trip! Tina Price – Just a couple of kms out of town Oranje Tractor organic winery is well worth a visit! Beautiful wines, amazing locally sourced and farm grown produce and warm friendly welcome from Murray and Pamela and Merlot (the dog). I was a WWOOFer at this wonderful place for three months last year. Amanda Moraboti Smith – Whaling Station Scones and cream. Danella Cause Smyth – Torndirrup NP Natural Bridge & The Gap. West Cape Howe NP. I think there is a coastal drive of beautiful beaches from memory. Caroline Crossman – The Gap, Emu Point, Whale World and best lookout from Anzac Hill. Booking.com has 41 properties in Albany including hotels and apartments. You get free cancellation on most rooms and a best price guarantee. What other tips can you add for things to do in Albany? Please share any suggestions in the comments. Albany looks like a charming place. Every time I visit your site, I discover something new about Australia and reminded that it’s such a diverse country! I’m glad my sis is there and it’s an excuse for me to plan my visit there soon! Australia is very diverse. Yep, definitely a good excuse to come visit your sis. Same here Renuka. I also find their blog so amazing. This family always share new ideas and knowledge to their readers. I envy the beaches. They offer so beautiful beaches. Nice place you stayed also, nothing beats a view from the beach when travelling. This also seems a safe and secured place especially bringing kids around. 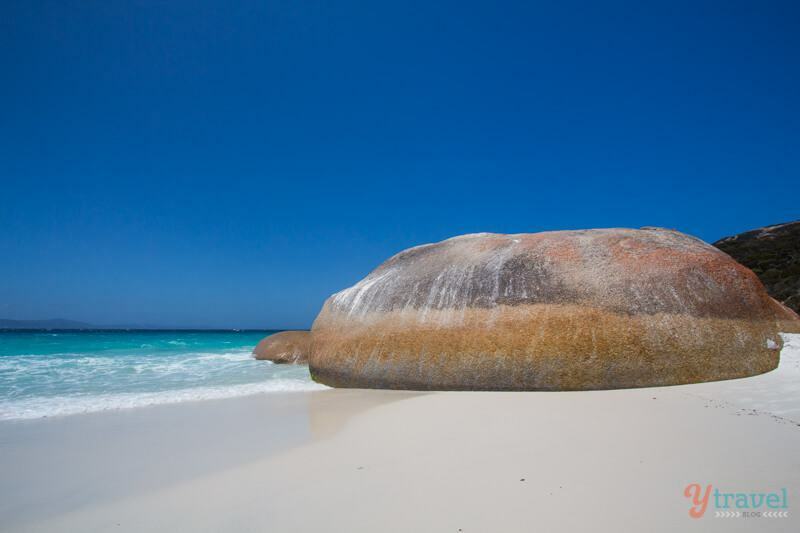 Love the photos here and love Western Australia. I was lucky enough to spend a few weeks traveling up the coast and preferred it so much more to the popular east coast backpacker route. From snorkeling with whale sharks and manta rays, to the dolphins at Monkey Mia and Karijini National Park, it’s an outdoor lovers paradise! Hope to return some day. Glad you visited WA and loved it over there Jared. More people should definitely head west, it’s a highlight of Oz for sure! The first 2 beaches are really awesome. I Live in Brazil and I Always want to visit Australia, now I found your site I am seeing how many beautiful places are in your country. the beach is beauteful. Definitely Austrália is very diverse I Love the photos. Congratulations for yours the blog..
tha Australia is Bealtiful is is very diverse to. ohh, the local is beautiful. They offer so beautiful beaches. Nice place you stayed also, nothing beats a view from the beach when travelling. 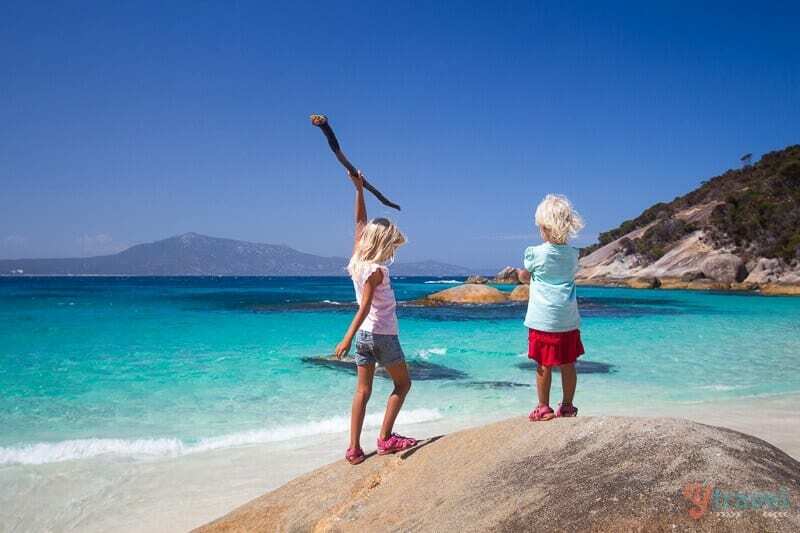 Ual love the photos here and love Western Australia. I was lucky enough to spend a few weeks traveling up the coast and preferred it so much more to the popular east coast backpacker route. These images are really impressive. On my next trip abroad, Australia is one of the business points.